One of the biggest surprises of the year for me has been Songs for the End of the World. Sure, I know a handful of Rick Springfield’s hit and while I’ve never had a problem with them, I never felt truly compelled to seek out any of his albums. Well, I was aware this album was coming out but still wasn’t too interested in checking it out. Then I came across some extremely high praise for this album online and decided that I needed to see what the big deal was. My conclusion? This is one of the best albums I’ve heard all year. 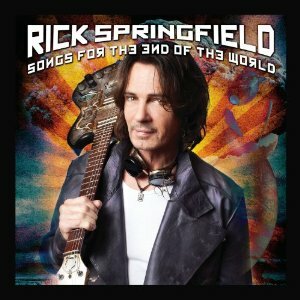 Now, I’m not someone who has followed Rick Springfield throughout his career so perhaps his fanbase already knew what to expect from Rick but for anyone who remembers him for “Jessie’s Girl’ and being an ’80s heartthrob on a soap opera, there is nothing retro or ’80s about this album. Springfield has crafted a near perfect masterpiece of modern rock/pop with Songs for the End of the World. If this album had been released by an artist half (or a third) his age, we’d probably have some big radio hits to talk about here. Sadly, that’s not how the music business works these days but at 63 years old, Rick’s voice is fantastic, the lyrics are excellent, the production is amazingly well done and the songs themselves dig their way into your brain and decide to make themselves at home. If Rick’s back catalog is even half as good as this album, I’ve really really been missing out. I’ve seen a number of critics online stating this is easily his best album since returning to recording music in 1999 and some sites are even going as far to say it’s one of his best albums PERIOD. The first four tracks are outstanding: “Wide Awake” is a great opener, “Our Ship’s Sinking” and “I Hate Myself” are fantastic anthems that should go over HUGE with a live crowd and “You & Me” is the type of pop/rock ballad that should be all over radio. “My Last Heartbeat”, “Depravity”, “I Found You” all have a very modern, dark heavier edge to them. “I Found You” especially. A band of twenty-somethings should wish they could write this good. “Love Screws Me Up” is yet another classic anthem that is sure to go down great in a live setting. “One Way Street” and “A Sign of Life” are good songs but they are the only songs that song a bit less modern but not in a “oh, that sounds like an ’80s song” kind of way. Maybe “timeless” is the correct word? The only two tracks that fall flat with me are the ballads “Joshua” and “Gabriel”. I just can’t get into ’em. If you’re a fan of melodic rock, you really have to pick this album up. I’m converted based off this album alone.